February 8th, 2019 - Does My Bomb Look Big In This? Harking back to the golden era of Hollywood with an eye-catching retro font, wall art and colour scheme, Matinee caught my eye on a recent jaunt down Addison Road. With the very name clueing you in that this spot is designed for afternoon performances, I was pleased to slide in after 2.30pm and still be able to eat either breakfast or lunch. The décor is theatrical, from the central glossy burgundy-tiled table surrounded by green velour chairs, to two dramatic art deco triple ring chandeliers with long burgundy fringing. 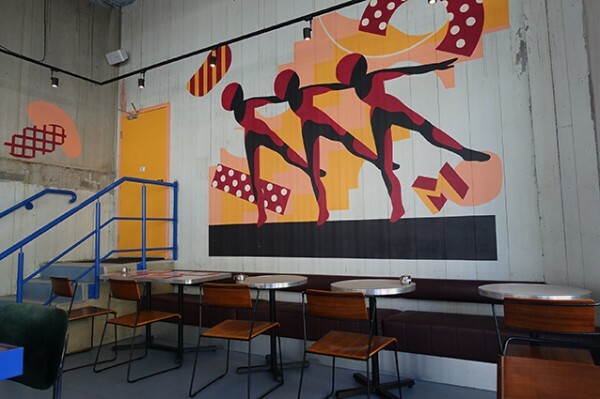 The same colour carries through onto a cushioned leatherette banquette, running along a concrete back wall, with an all-singing, all-dancing mural. 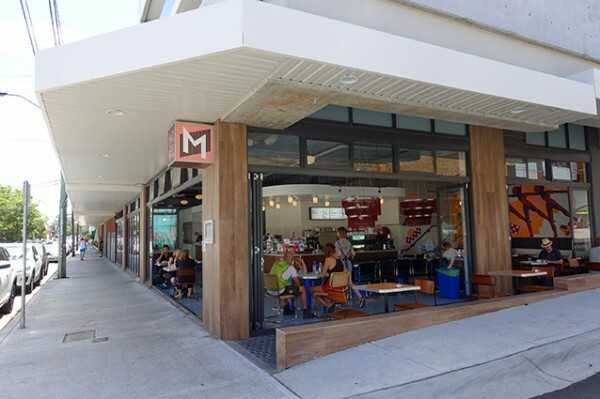 While some say the space channels the Greek-Australian milkbars of my childhood, I certainly don’t remember any that looked quite like this – well, except in American movies. 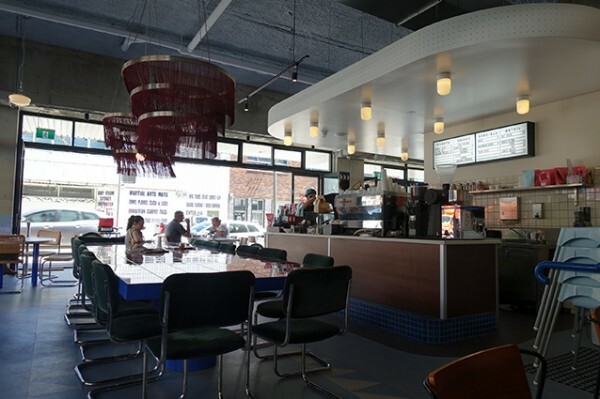 Instead I’d describe the combined counter and kitchen as something like a classic art deco cinema’s candy bar. 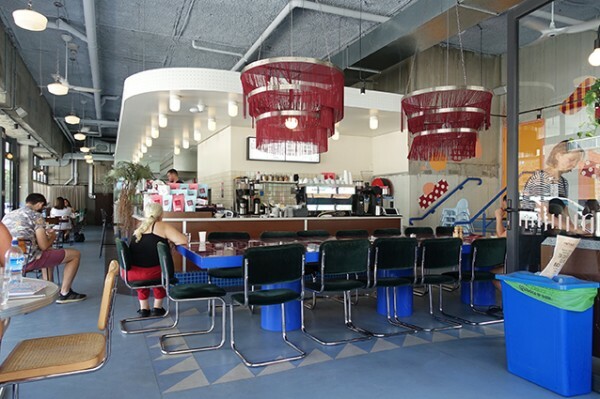 It adds some lovely curves into the high-ceilinged, industrial space, with its exposed fittings and roughly hewn concrete. Coffee - their own Matinee roast - pushes the envelope of not burnt in my Latte ($4) and challenges my usual practice of not adding sugar. 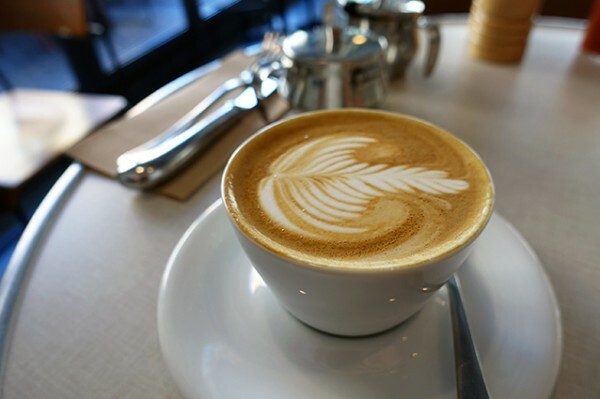 I eventually relent with a quarter teaspoon of raw hipster sugar, and it’s better, with good acidity at the front and a dark rumble in the rear. 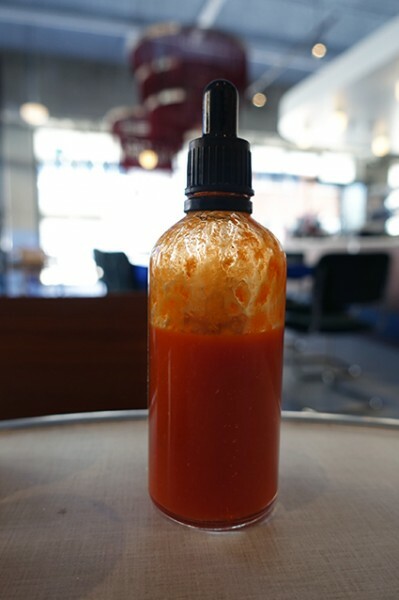 I’m more excited by the house-made Habanero Sauce ($15/bottle) delivered to my table without me needing to ask for it. It’s just the ticket to give my muddy Pork Cassoulet ($20) some clarity. This dish has a quite lot going on. While the coffee-rubbed pork shoulder is plentiful, it’s a bit dry and stringy. It sits in a thick, tomato-heavy stew dotted with diced carrot and mushy borlotti beans. I really prefer white beans, like butter beans or cannellini beans in this dish. 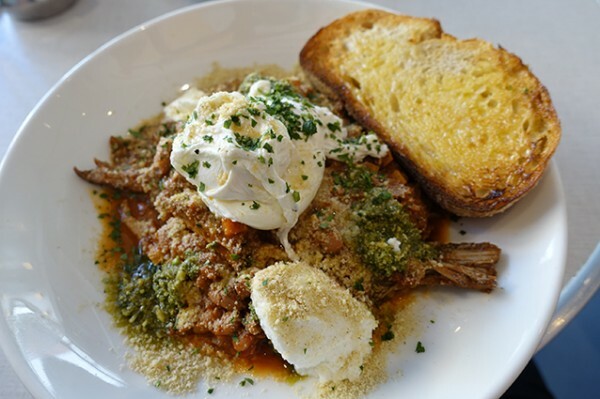 The cassoulet garnished with an equally hectic array of poached eggs, blobs of basil nut pesto, a dusting of parmesan crumbs and goats’ cheese, along with a slice of buttered sourdough that is gone much too quickly. The basil pesto is, to my palate, a mistake. On my follow-up visit, Donna Summer is blasting out Bad Girl, which, with the retro colours, gives the space a last days of disco vibe. 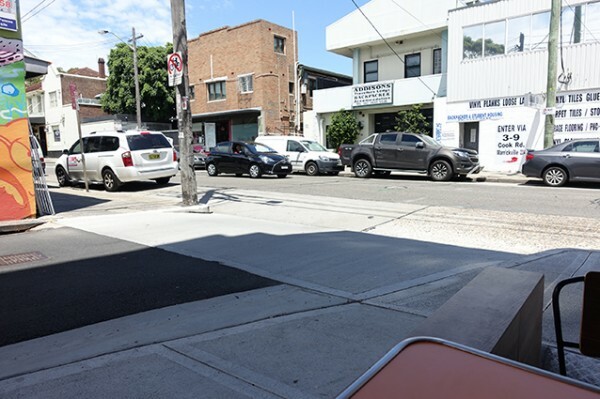 It’s stinking hot, so I sit outside at a bright orange table, to catch whatever skerrick of breeze is flowing down Fotheringham Lane. Service this time is slower off the mark, but affable enough when my menu does finally arrive. 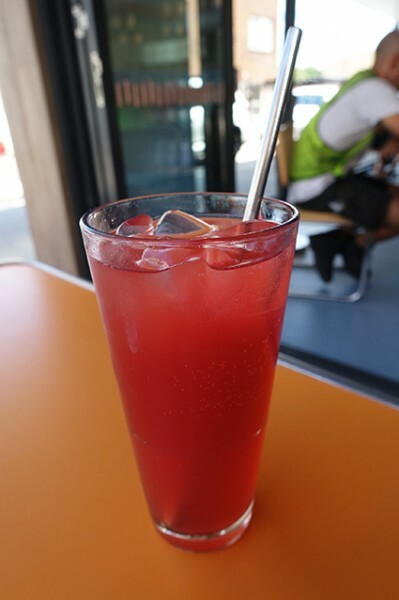 My Creaming Soda ($6) is served with ice and a metal straw, though it’s too sweet to really be refreshing. While the waitress was unable to tell me whether the soda syrup was house-made, the drink is low on fizz and has an interesting flavour. With owner, Charles Cameron, coming out of Brewtown, hitting up the sweets seemed important. 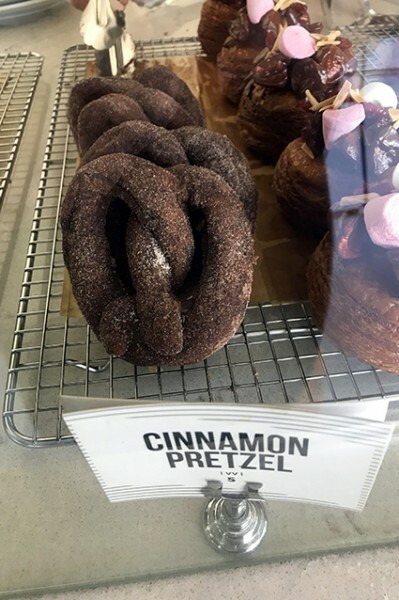 The menu is full of American favourites like key lime pie, pecan pie, and pretzels. 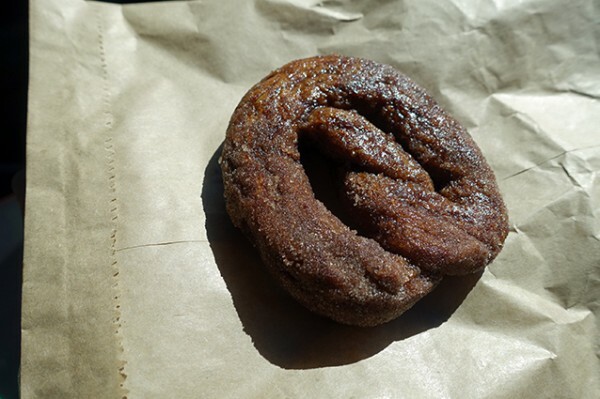 While the Cinnamon Pretzel ($5) didn’t look too fancy, and certainly wasn’t helped along by it being a hot day, it ate with a certain nostalgic charm that reminded me of a chewy version of hot, buttered cinnamon sugar toast. 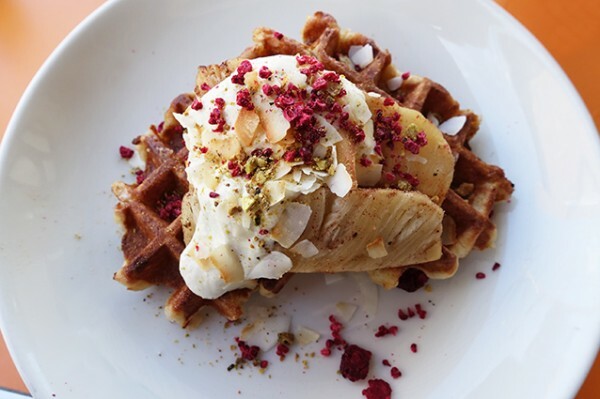 Expecting a sugar-overload, the Belgian Waffle ($18) surprised me with judiciously applied tangy, lime and honey buttermilk ricotta, lovely spears of caramelised tart pineapple and a dusting of pistachio, freeze-dried raspberries and toasted coconut flakes. It was only the waffles themselves that were a bit sugary and cakey. However after Thomas Keller (at his restaurant Bouchon in Las Vegas) showed me that Belgian waffles could be as light and airy as their thinner American counterparts, I’ve been a tough critic.